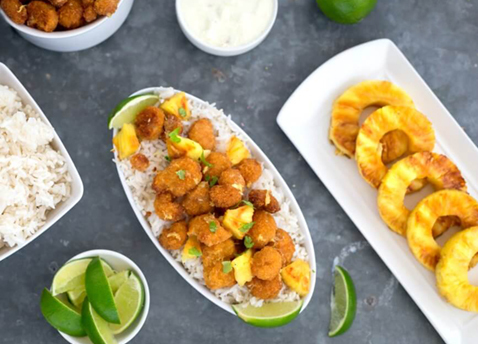 This tropical family favorite from A Helicopter Mom puts popcorn shrimp in the spotlight in a way we’d never thought of before – alongside grilled pineapple. 1. Prepare Piña Colada Dipping Sauce. Chill in refrigerator until ready to use. 2. Grill pineapple slices on both sides, then cut into chunks. 3. Begin to bake shrimp according to package directions. While shrimp is baking, prepare Pineapple Sauce. 4. Before the last 5 minutes of baking, remove the shrimp from the oven. 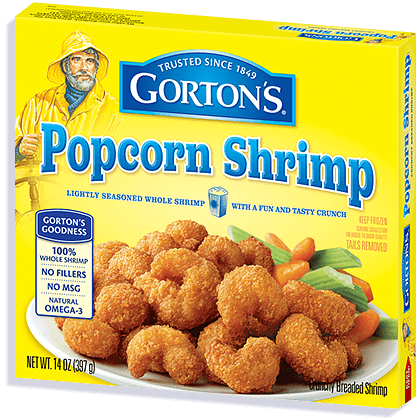 Drizzle the pineapple sauce over the popcorn shrimp, then return to the oven for the remaining 5 minutes. 5. Spoon pineapple and shrimp over cooked rice and serve with the Piña Colada Dipping Sauce. Enjoy! 1. Combine sour cream and cream of coconut in a mixing bowl, gently mixing by hand. Do not overmix or the sour cream will break down and make the sauce too runny. 2. Drain crushed pineapple, then fold into the cream mixture. 3. Gently stir in the lemon juice. 4. Cover and store refrigerated. 1. Place all ingredients in a food processor, and pulse 10 times or until finely chopped and combined. Cover and chill until ready to use.